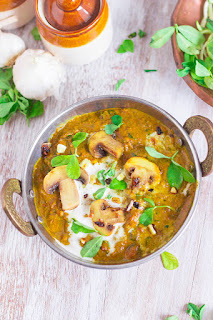 Vegan Eggplant Curry made by simmering sauteed eggplant in a spicy coconut gravy. It was today, 12 years ago that I stepped foot into the Corporate jungle. My first day at my first job. A job I had waited 1.5 years to join, a long wait. A special day in the life of a young Engineer. It was also special for another reason. It was the day I met Raj. We've known each other for 12 years, starting from that day. 12 years is a long time to know someone. You tend to learn every annoying little detail there is, every story has been told, there are no skeletons left in the cupboard. When I predict he will do something to the "T", he thinks I'm guessing, but I know him so well that I don't need to guess anymore. There is comfort in knowing someone so well, there is warmth in trusting a person so much. These two feelings of comfort and warmth are echoed in today's curry. A good curry is like a warm hug from inside. It is supposed to make you feel at home, it is supposed to make you smile for no reason at all. It is supposed to make you feel like you are in your pajamas even when you are dressed to impress. It is supposed to be something you cannot resist taking another helping of. 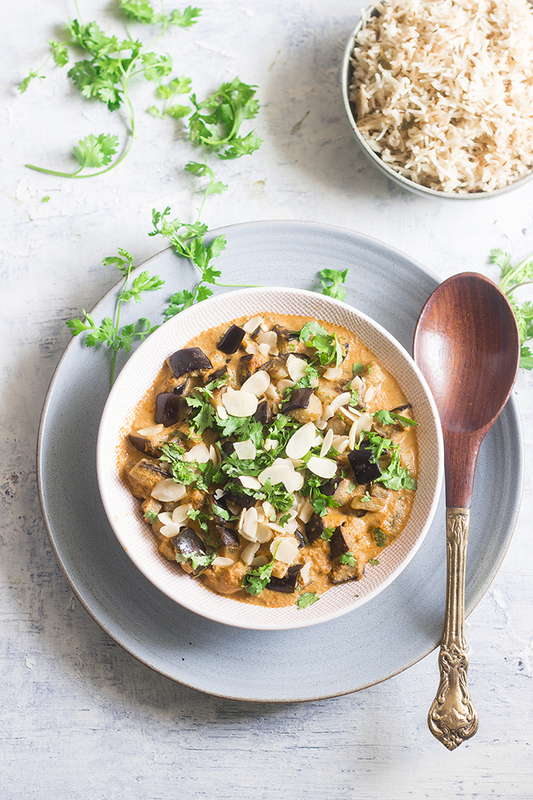 This Eggplant Coconut Curry is all that, and more! 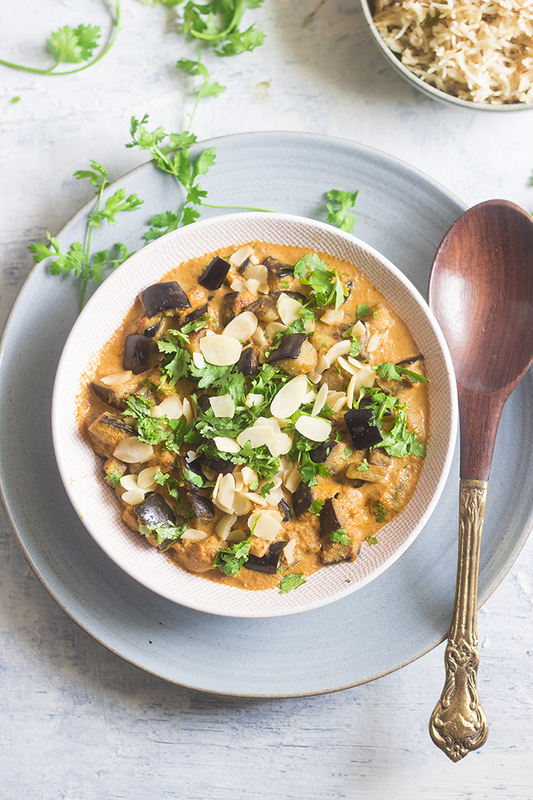 This Eggplant Coconut Curry is made by first sauteing roughly diced eggplant in coconut oil until they are brown and soft. Then a gravy is made by adding coconut milk to sauteed onion and tomato puree. Spices, a lot of them are added to flavor the curry. The curry is finished off in true Indian style with a tempering or "tadka" of mustard seeds and curry leaves. 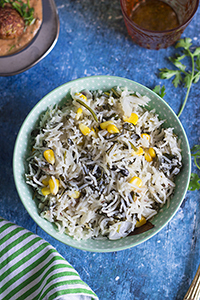 Garnish with sliced almonds and the quintessential coriander leaves. You can use pine nuts or cashew nuts too. This is just an indulgent step and skipping it will not affect the flavor of your dish. 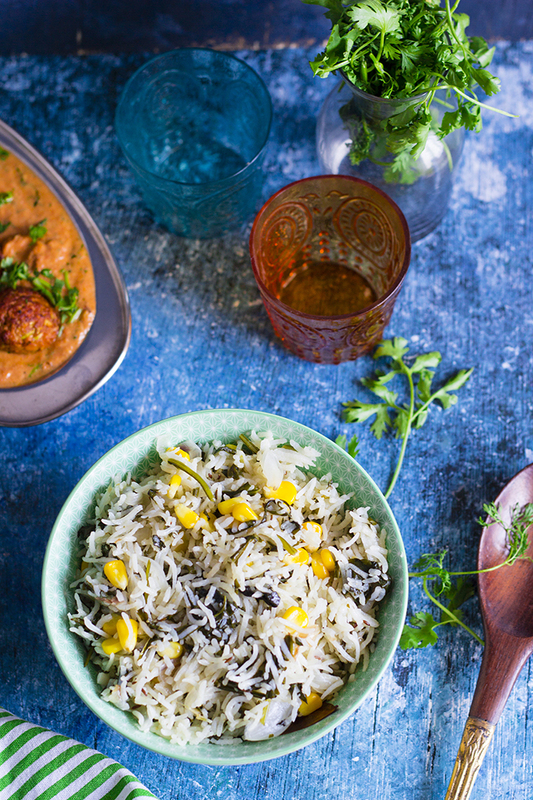 This curry is simple if you know your way around in the kitchen. If not, I have a quick video to help you out. This Eggplant Curry is vegan. 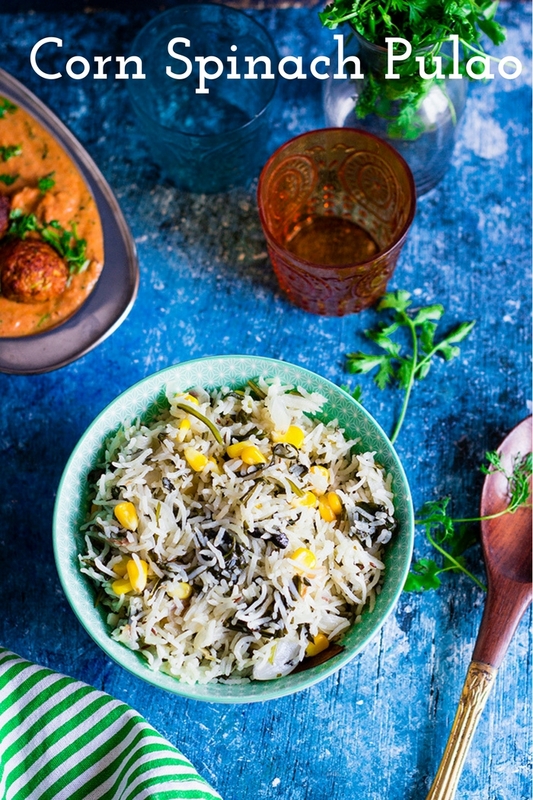 It can be made gluten free by skipping the asafoetida. It can also be easily doubled or tripled and is perfect for a large family gathering. It requires barely any prep too. 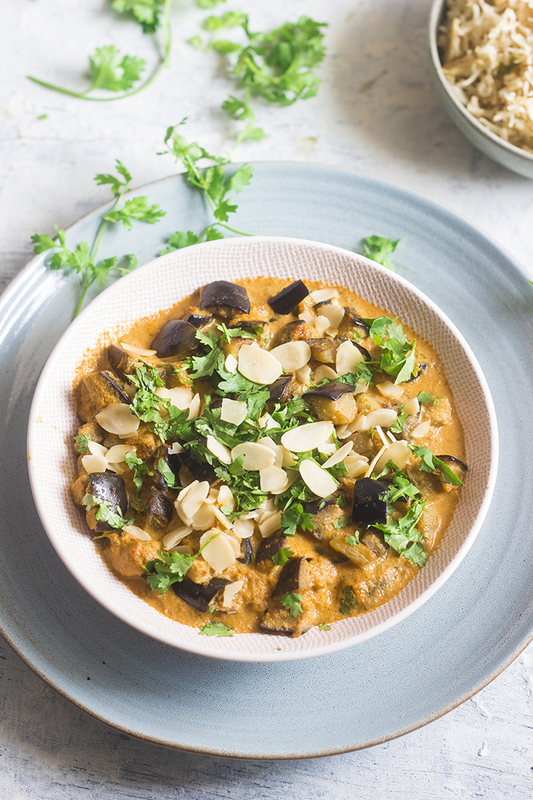 The Eggplant Curry uses a mix of different spices like fennel powder, coriander powder, cumin powder and garam masala. If you don't have all of them, just use what you have, or use your favorite Indian spice blend or curry powder. 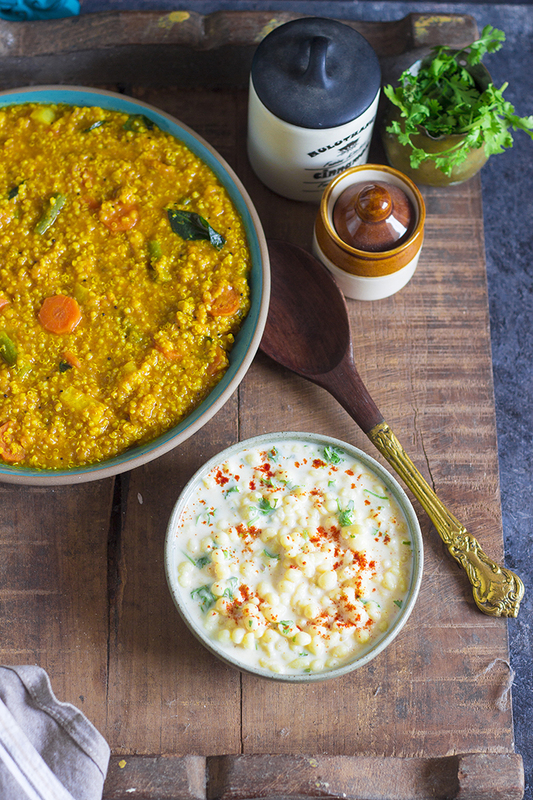 Serve the curry with roti, naan or jeera rice like I did. Flavorful curry made by simmering sauteed eggplant in a vegan gravy made with coconut milk and flavored with a mix of spices. 1. Dice the eggplant into small pieces. 2. Heat 1 Tbsp coconut oil in a pan and add the diced eggplant. 3. Add salt to taste and saute the eggplant until it is cooked. Remove and keep aside. 4. Puree the onion and tomato separately. 5. Heat 1 Tbsp coconut oil in a pan and add the pureed onion. 6. Add the ginger garlic paste and saute until the onion browns slightly. 7. Add the pureed tomato and cook until the liquid evaporates. 8. Add all the spice powders and mix well. 9. Add 0.5 cup of water and simmer on low heat until for 4-5 minutes. 10. Add the coconut milk, salt to taste and the sauteed eggplant. Mix well and simmer on low heat for 4-5 minutes. 11. Heat the remaining oil in a different pan. Add the mustard seeds and allow them to splutter. 12. 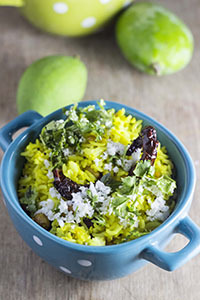 Once the mustard splutters, add the curry leaves and remove from heat. 13. Add this tempering to the curry. 14. Garnish the curry with sliced almonds and chopped coriander leaves. 15. Serve hot with roti or rice. Toasted bread layered with crispy papdi and boiled chickpeas, topped with sweet yogurt, a mix of chutneys,spices and pomegranate seeds!! Happy Tuesday! I hope all of you had an awesome fun filled weekend. I sure did. In fact, I had a fun filled week! If you follow me on Instagram, you would know, I was out vacationing the last week in Karkala at my in-law's place. I met a lot of relatives, ate a lot of good food and visited a lot of places. And my favorite among them was this beautiful little Jain temple at Varanga. Set amidst a lake and surrounded by greenery, it was mesmerizing. The temple is 850 years old!!! Check out the pics on Instagram. There was also a TV serial shooting going on there, so we had some of our own fun directing it among ourselves, we created so many story lines in a short span on 10 minutes. Don't you just love making up your own movies? I definitely do. Now back to my recipe - Dahi Bread Chaat. 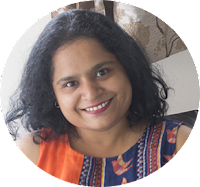 I asked a few of my readers who I know personally what they would like me to publish, and a few of them wanted quick snacks, so here it is. 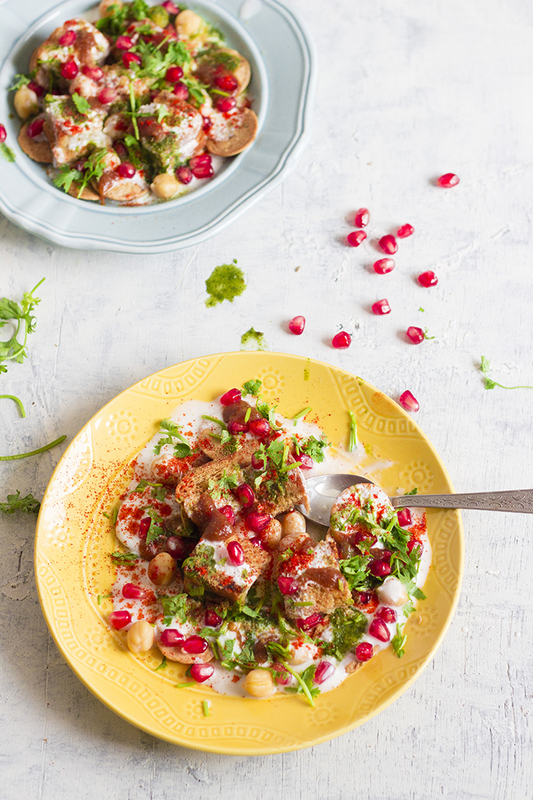 This Dahi Bread Chaat is my take on Dahi Bhalla, only it is super instant. No soaking, no grinding, no frying. Healthy and ready in a jiffy. Could you ask for more? 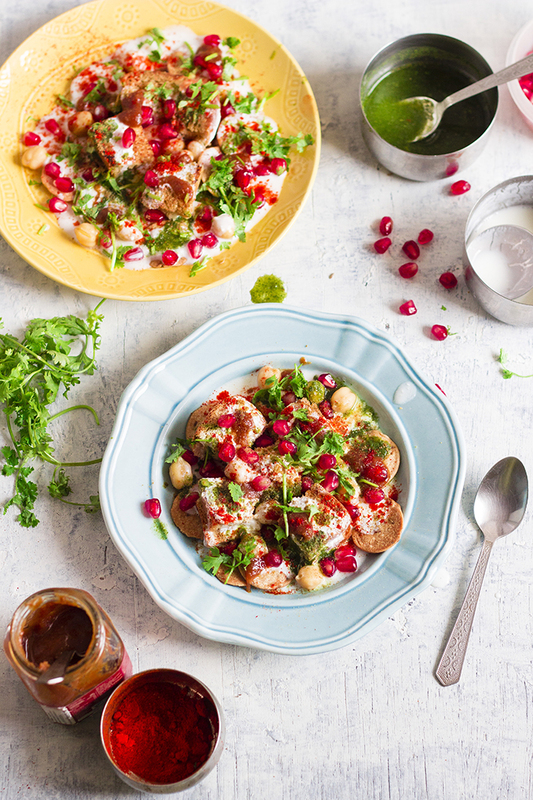 Dahi Bread Chaat is the perfect dish, if you are personally catering to a small group of friends or family or kitty parties. It requires minimal prep and can be assembled quickly, so you won't be spending all your time in the kitchen instead of mingling with your loved ones. This is also ideal as an after school snack for kids. 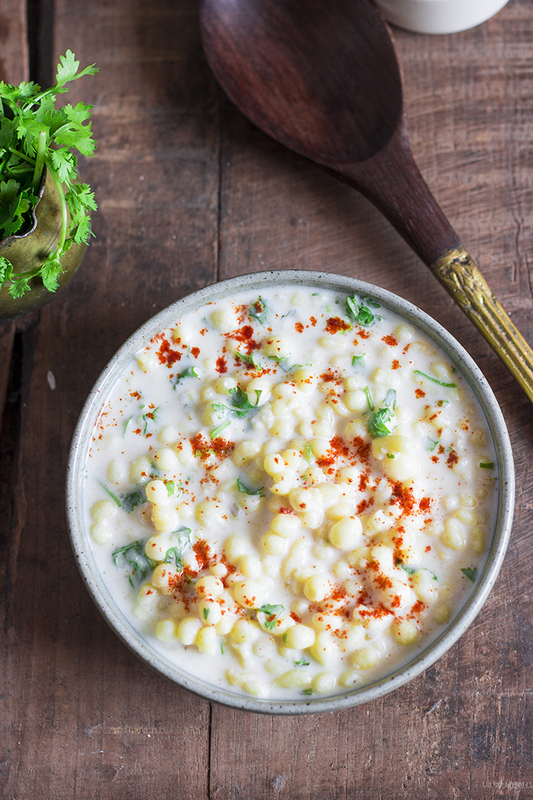 To make this dish vegan, use any vegan yogurt such as soy yogurt or cashew yogurt. 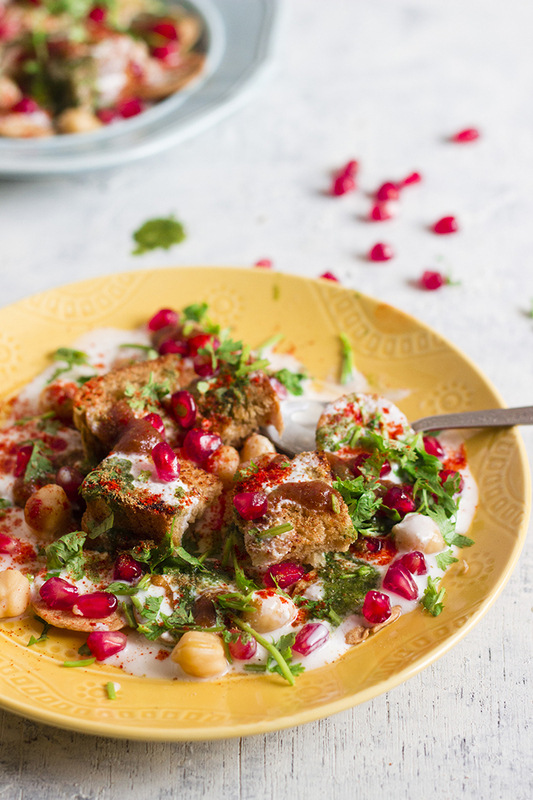 Dahi bread chaat - Indian street food with toasted bread layered with crispy papdi and boiled chickpeas, topped with sweet yogurt, a mix of chutneys,spices and pomegranate seeds. 1. Whisk the yogurt and add the powdered sugar to it. 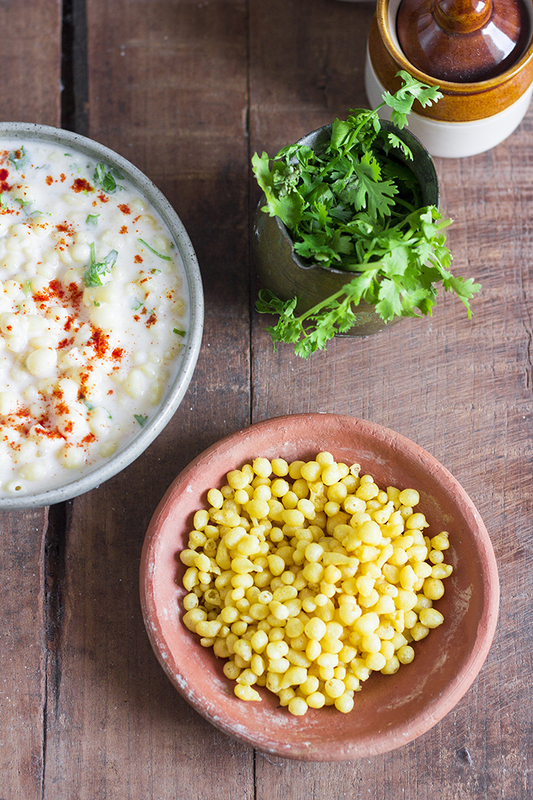 Mix well and chill till you are ready to assemble the chaat. 2. Toast the bread and cut the bread into 9 small pieces. 3. Divide the papdi and layer in the plates that you will be serving the chaat in. The following instructions are to be repeated for each plate. 4. Place the bread over the papdi. 5. Add the chickpeas to the plate. 6. 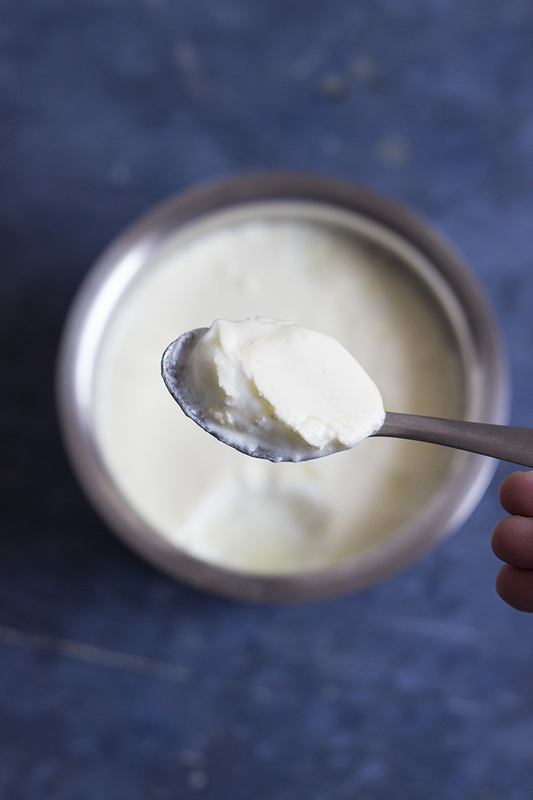 Now spoon the whisked yogurt over the plate. 7. 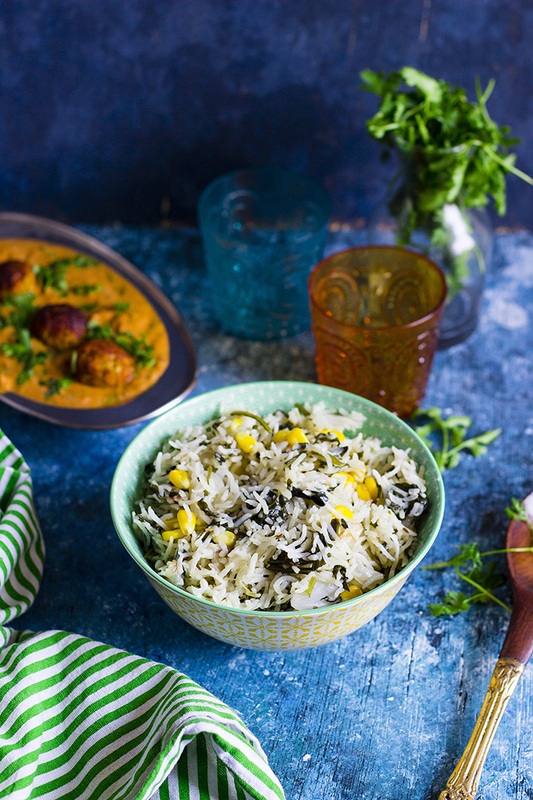 Drizzle the sweet date and tamarind chutney and the spicy mint coriander chutney. 8. Sprinkle red chilli powder, cumin powder and chaat masala. 9. Sprinkle salt as required. 10. Add fresh pomegranate seeds. 11. 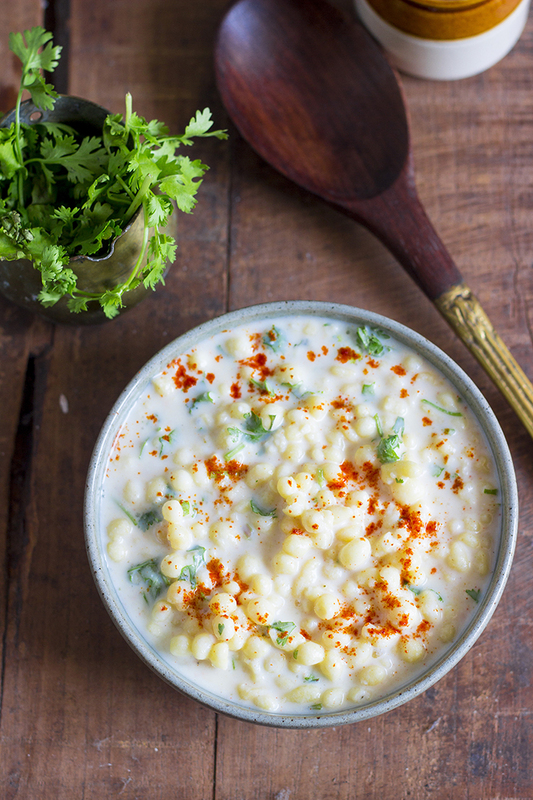 Garnish with the chopped coriander leaves and serve. This is my first outstation post in a long time. As you must have read here, I am not in Bangalore, but at my in-laws place near Mangalore on the West Coast. I've been enjoying my time off but definitely not the heat. We can feel the full effect of summer out here. I'm just thankful for the bursts of rain at night which make it cool enough for me to sleep. And of course, the ice creams!! If you have come to Mangalore and missed the ice creams here, you have missed out on a lot of deliciousness. From when I can remember, Mangalore had the best ice creams ever!! I never miss a chance to hog on those when I'm out here. While the ice creams are tempting, this post is not even remotely related to ice creams, but I could really not get them out of my head. 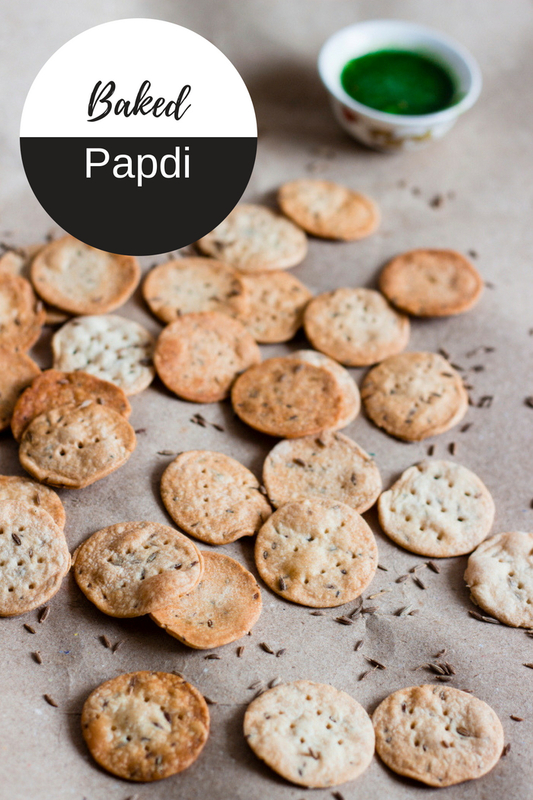 This post is about a much healthier snack - Papdis, that have been baked. Papdi are just flat discs made from wholewheat flour and flavored with some spices. Traditionally these are deep fried, but I baked them, just to keep them guilt free. And they tasted just as delicious, but now I can eat a lot more without worrying. Papdis can either be eaten as a tea time or mid day snack or can be added to other dishes, most popularly - Chaats. 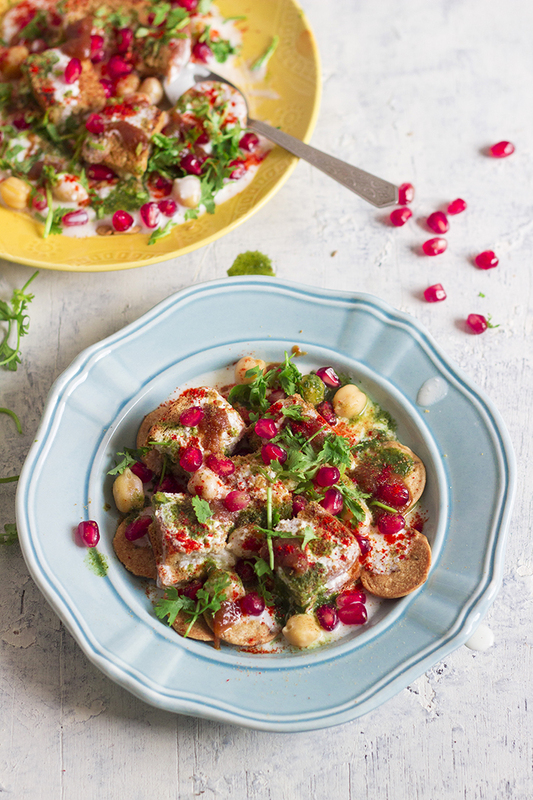 Chaat is a collection of Indian street food and many of them use papdis as the building blocks for them. They are the crunch element of the dish. They are added to Masala Puri, Papdi Chaat, Sev Puri etc. You can either make plain papdi, where you don't add any spices but personally I like ajwain (carrom) and jeera (cumin) a lot, so I never skip them out. Also, I suggest get on to making papdis fast and log onto the blog soon. 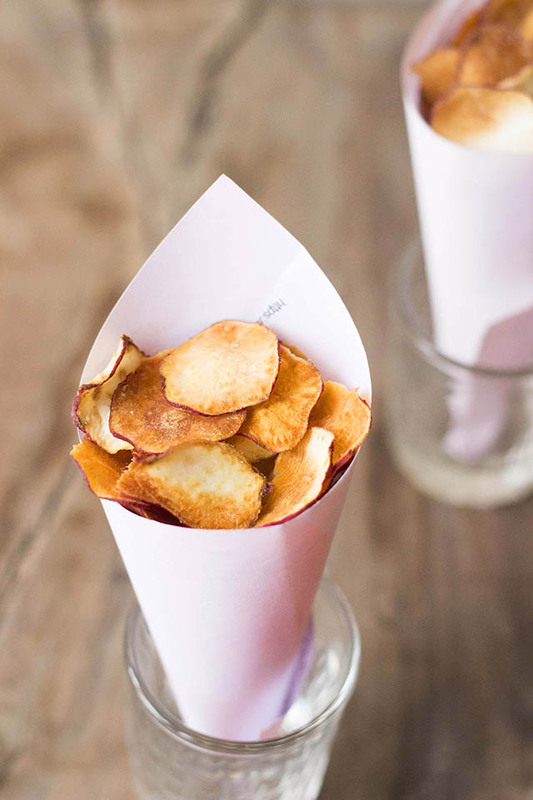 I have a new recipe planned that uses these crunchy papdis in a simple yet fabulously delicious dish. Until then, goodbye from the West Coast! Flat round discs made with flour and spices, a popular vegan Indian snack. 1. Take wholewheat flour, all purpose flour, carrom seeds and cumin seeds in a large bowl. 2. Add the oil and salt. You may need less/more salt, so add it little by little. 3. Start by adding half the water and knead the dough. Add more water by the spoonful as required. 4. The dough should have a stiff consistency. 5. Cover and rest the dough for 20-30 minutes. 6. Divide the dough into 2 balls and roll one of them out until it is 1 millimeter thick. 7. Use a cookie cutter to cut the dough into papdis. You can also use a bottle /box cover to do the same. 8. Do the same with the second ball of dough. 9. Preheat the oven to 180 degree Celsius. 10. Grease a baking sheet and place the papdis on it in one layer. They should not overlap. 11. Using a fork, prick holes into the papdis. 12. Brush oil over them and bake until golden. 13. Mine took 14-15 minutes to bake. If the papdis are rolled out thin they will start burning, so I suggest checking on them after 12 minutes. 14. Allow the papdis to cool completely before storing in an air tight box. Indian summer cooler (mocktail) made with Guava and spices! If there was another fruit, other than the mango, that screams Summer to me, it is the guava. A better part of our childhood summers was spent on guava trees. They are some of the easiest trees to climb, if you are into that stuff. We would be tree hopping all morning until it was time for lunch. Mango, guava, and so many more tree. Me not so much as Gee and my cousin. If you've had pleasure of plucking a fruit right from the tree and eating it then and there, you know how that feels. That fruit is so much more sweeter than what we buy outside. After moving to Bangalore, I'm yet to spot a guava tree, but that doesn't stop me from buying and eating them. After all, it brings on nostalgia, and who doesn't love that? This is the first time I did something other than directly eating the fruit. I made us a summer drink. Guava Panna! Panna is a spicy summer drink most commonly made from raw mangoes. Check out that recipe here. I've used fresh guavas to make the juice, but feel free to use your favorite Guava Juice to make the same. I added a little twist to the regular guava juice to make the Guava Panna. The juice is spiced with roasted cumin powder, red chilli powder or paprika, black salt, regular salt and some sort of sweetener if the guava isn't sweet enough. I used jaggery to sweeten up my drink, hence, the slightly brownish tinge to the drink. Use the quantity of the ingredients in the following recipe as a guiding value and adjust them according to your taste. You can add mint, lime and/or sparkling water or soda to create your own version of the Guava Panna. 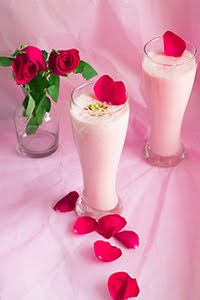 Guava Panna is an Indian summer drink made with guava and spices. 1. Mix all the ingredients in a large jug. 2. Adjust the spices and sugar according to your taste.